They crossed the border at dead of night, a 12-week-old baby in her mother's arms. They tiptoed through a minefield, squirmed through barbed wire. The cost: 15,000 Syrian pounds; the reason: an unexplained sickness that had overcome the infant. In a bare room on the Turkish side of the border, where the sole piece of furniture is an old television set, the little girl was wheezing and breathing heavily. "We were very scared, but we had no choice," said the father, who asked that the family's names be withheld. "In Qamishli [north-east Syria] nobody could help, so we decided to come to Turkey. She has breathing problems." She is not alone. Doctors and aid workers on both sides of the Turkey-Syria border are raising the alarm about a public health emergency careering out of control and spreading across southern Europe as the tide of human misery from Syria inexorably heads north. According to doctors struggling to cope with minimal state help in the frontier region, measles and other infectious diseases such as cutaneous leishmaniasis [which causes skin sores] have started to appear on both sides of the border. The World Health Organisation has already raised an alert about the revival of polio in northern Syria. All were previously illnesses under control in the neighbouring countries. "Communicable diseases like measles, typhoid or TB are now popping up in Turkish cities," said Dr Ramazan Kaya, a member of the Chamber of Medical Doctors in Mardin, south-eastern Turkey, and specialist for internal diseases at the Nusaybin state hospital. He underlined a sharp increase of typhoid and dysentery patients on the Turkish side over recent months. "We are very worried by this development. So far, our warnings have fallen on deaf ears in Ankara." "Turkey shares an 850km border with Syria," said Dr Cengiz Günay, secretary of the Chamber of Medical Doctors in Diyarbakir, the country's south-eastern capital. "Every day, people cross these borders unchecked in both directions, be they refugees, smugglers or others. We cannot be sure if any of these people are ill. And some of them might travel on to other Turkish cities, to Istanbul or Ankara, and from there on to Europe. 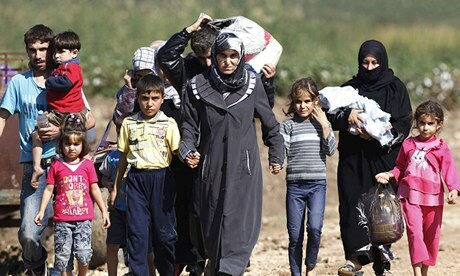 It is time that the world paid attention to the terrible humanitarian drama unfolding in Syria." The situation appears particularly acute in the north-east, heavily populated by Syrian Kurds who are under attack both by the Damascus regime and by the Islamist militants of Jabhat al-Nusra and other al-Qaida affiliates. They have quarantined the region, blocking the delivery of aid supplies and urgently needed medicines. Medical staff and aid workers with recent access to the region say medical stocks have vanished, that medical equipment is antiquated and obsolete. "Qamishli might possibly be the world's biggest open air refugee camp right now," said Kaya. "Sanitary conditions are dismal. Water is no longer chlorinated, rubbish isn't collected anymore. "Syria is known to have had very good healthcare. Since the beginning of this conflict, the system has started to break down, and it is getting worse by the day. There are shortages of everything – medicine, vaccines, medical equipment." The sick baby's father said Qamishli was now flooded by Kurds from surrounding villages displaced by a wave of recent attacks by Islamist groups such as Jabhat al-Nusra or the Islamic State in Iraq and the Levant. The European Union's most senior official in charge of the world's biggest humanitarian aid budget, Kristalina Georgieva, urged the international community to insist on access for health professionals to the blocked region, in the same way that the regime was forced to open up to chemical weapons inspectors. "The importance of access cannot be stressed enough," the commissioner in Brussels told the Guardian. "We urge the international community to demand access for health professionals in the same way we got access for chemical inspectors to work in Syria. There have to be loud and clear calls to both sides of the conflict that the targeting of healthcare professionals and facilities must not continue." A recent WHO report said 60% of Syrian hospitals have either been damaged or completely destroyed during the conflict. Large numbers of doctors have fled the country. The Turkish doctors say the situation in the north-east, as well as in Kobani and Afrin, is exacerbated by the Syrian regime's deliberate neglect of regions with a predominantly Kurdish population. "The Assad regime has ignored the country's Kurdish population for a long time, excluded them from all development and investment," said Dr Mehmet Demir, head of the Chamber of Medical Doctors in Batman, south-eastern Anatolia. "Most of the equipment is from the 1950s – machines you might usually find at a scrapyard." Demir was in the Qamishli region of northern Syria a week ago. "What I saw in the small clinics is inhumane, a tragedy," he said. "Surgery is performed without anaesthetics. Desperate Syrian doctors told us that for most operations now they have to rely on luck rather than skills. Pharmacies are pretty much empty everywhere." According to the WHO, local production of medicines has collapsed by up to 70% since many pharmaceutical plants have been substantially damaged. Prior to the start of the conflict in March 2011, 90% of medicines in Syria were produced inside the country. "The impact of this conflict on the health situation in Syria is horrible," Georgieva added. "Access for humanitarian aid workers inside Syria has not improved despite an extremely dramatic deterioration of conditions inside the country. The government needs to ensure that medical supplies get in and that health professionals can operate freely, that hospitals and health facilities are rebuilt. Only one fourth to one third of the health teams that could have been active in Syria are actually operating because of the lack of access." For those who have escaped into Turkey, only those who are transferred to the country's official refugee camps receive medical checks and vaccinations. But thousands prefer to lodge with family members all over the country, or move on to bigger cities in search of work or a route to Europe. For women facing pregnancy complications, it is almost impossible to receive emergency obstetric care. Turkish doctors say figures for cot deaths and women dying during childbirth have exploded. People with treatable chronic illnesses such as diabetes, kidney and cardiovascular diseases receive no professional care. Local officials in Nusaybin claim that Turkey deliberately keeps aid from going to Syrian Kurds, and that Turkish aid organisations ignore the north-east. "Turkey refuses to open its borders. They refuse to help the Kurds," said Ayse Gökkan, Nusaybin's mayor from the pro-Kurdish Peace and Democracy party (BDP). Her party has been collecting donations of food, clothing and medicines from all over Turkey, but she stressed that it was like the proverbial drop in the ocean. "We try and send aid everywhere we can," said Hüseyin Oruç, deputy head of the Humanitarian Relief Foundation (IHH), a Turkish NGO delivering aid to Syria. "But we are already overstretched. The situation is bad everywhere in Syria, and we barely manage to meet maybe 1% of what is required. Syria has been abandoned by the world, and we have been abandoned trying to help Syria." All doctors are alarmed that previously good Syrian immunisation programmes have all but to ground to a halt in the country's north. "Vaccination deliveries have stopped. I have seen at least three cases of polio in Qamishli," said Kaya. "Measles are now very common, and has made its way across the border." Demir agreed: "This year we registered measles patients in the Batman region. We cannot be sure where the infections originated, but Syrian patients were the first to be treated for the illness." In their small Nusaybin home, the newly arrived family hopes that their baby daughter will soon get better. "We will try to make a life for ourselves here," said the father. "And we hope that one day she can return to a happier, peaceful Syria."